Keep finances on track with a real-time financial plan in Smartsheet. Whether you’re starting a business or looking for ways to grow an existing company, creating and following a financial plan can help ensure success. An effective plan can inform business decisions, provide documentation for investors and other stakeholders, and serve as a guide to help you reach objectives. Some businesses may choose to work with financial consultants or use software to manage financials, but for some teams, templates offer an easy method to begin strategic planning. 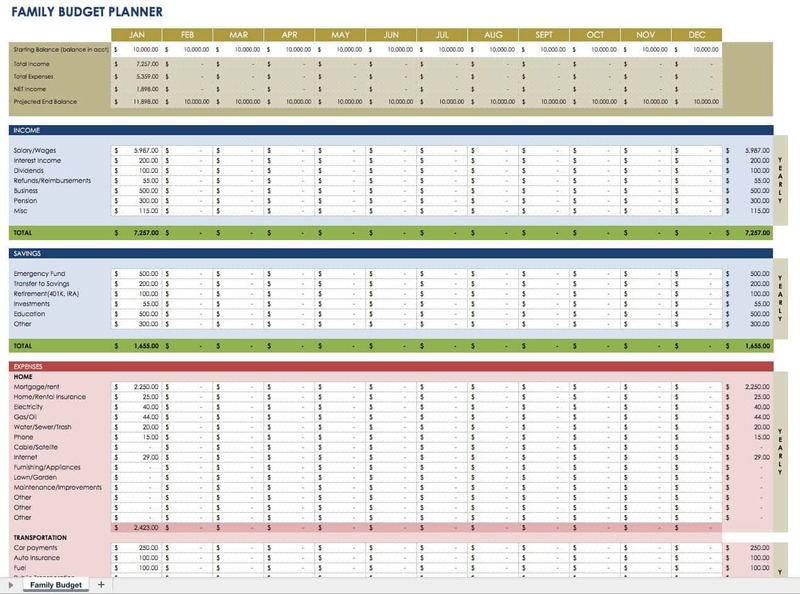 Below, you’ll find multiple free financial planning templates for both business and personal use. These free templates are designed for users with a wide range of experience levels, and offer professional quality along with simplicity. You’ll find templates for goal planning, financial projections, budget planning, retirement calculations, and more. 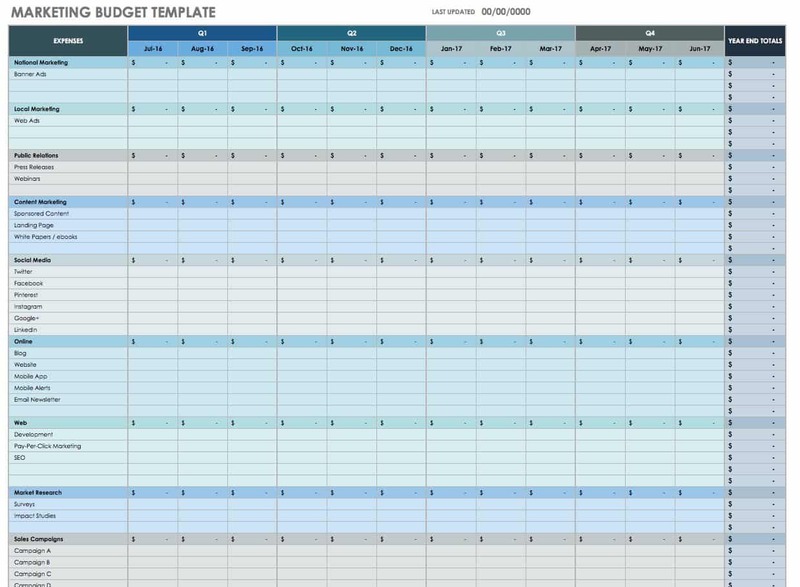 Designed for projects, this template allows you to list costs for each task. Depending on the type of project, you may include hourly services that contract employees provide, equipment costs, or other expenses. Create an estimated budget and then compare actual expenses to help with financial planning on future projects. 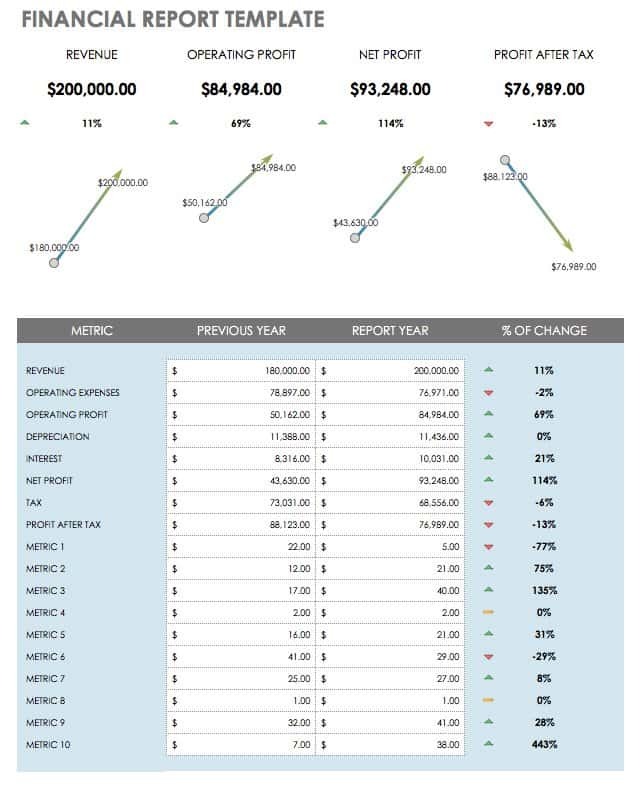 Use this sales forecast template to create financial projections for individual products on a monthly and annual basis. You can also track sales performance over time and compare figures from previous years. 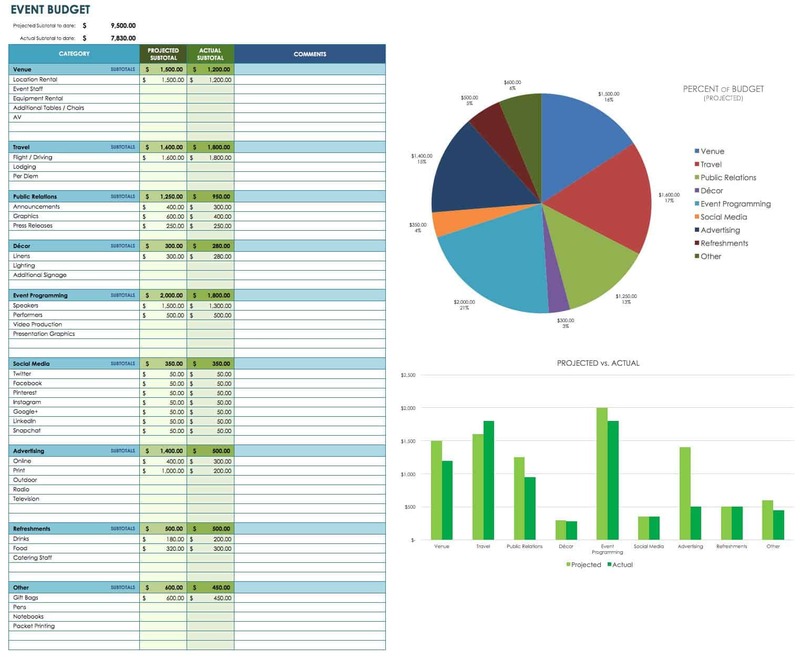 Color-coded cells make it easy to view data for each month, and the template calculates monthly and annual totals. Whether you’re planning a conference, company party, fundraiser, or wedding, any tool that helps organize your event planning process can reduce stress and aid in creating a successful event. 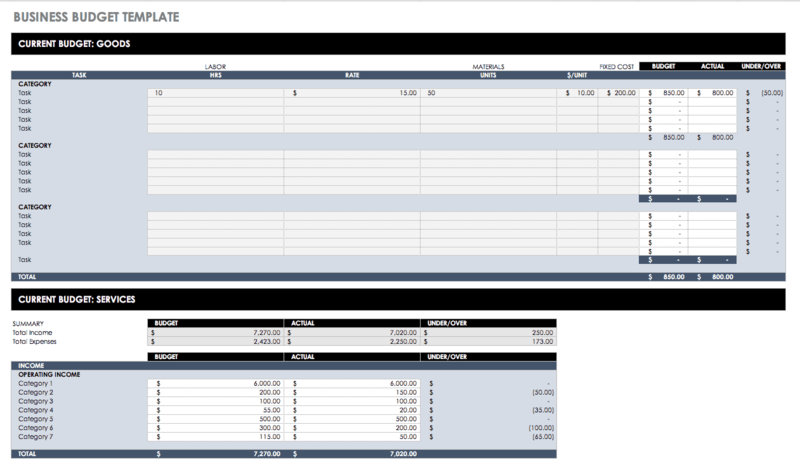 This budget template lists the many expenses involved in an event, from venue rentals to programming and advertising. It also compiles the data you enter into visual charts so that you can quickly get an idea of your event budget allocation. 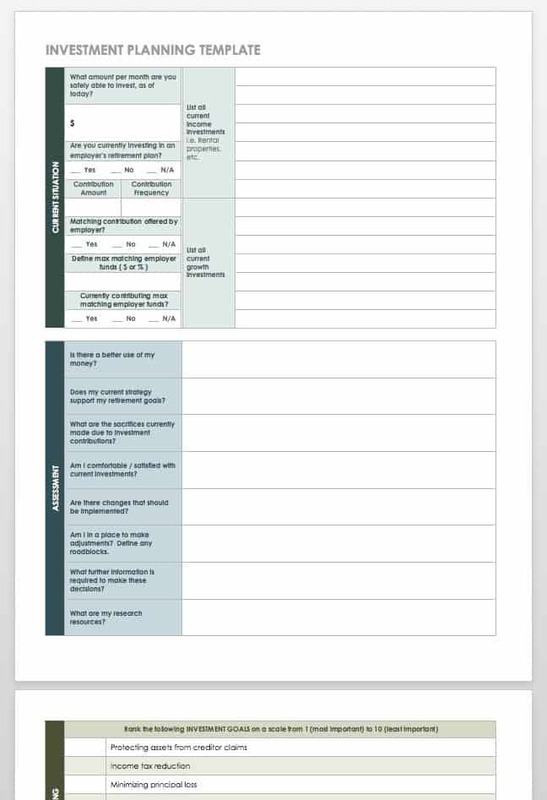 Create a financial strategic action plan with this Word template. You’ll find a basic outline to follow, including sections for an overview of your business or project, assumptions, risks, financial management methods, and more. Once you have created a comprehensive financial plan, use it as a living document, just like you would a business plan. You should review and update financial templates regularly in order to assess progress, provide accountability and accuracy, and ensure that it continues to meet your needs. This template provides a summary report of financial data with a dashboard view, which makes it easy to compile and quickly review information. You’ll get a combination of bar charts, a pie chart, and a graph to compare statistics over time. Use the template to measure product performance, view sales data, and chart annual revenues or other financial information. If you’re starting a business, this template can help you identify potential funding sources as well as necessary expenses to get your venture up and running. Similar to a budget template, you can track both estimated and actual costs, and make adjustments as needed. Identifying startup expenses can support your business planning process and help ensure that you have adequate financial resources to reach your goals. Create an annual financial report for your business that shows key metrics in an easy-to-read format. Getting a financial overview allows you to track performance over a given time period, and a summary report simplifies communication with stakeholders. 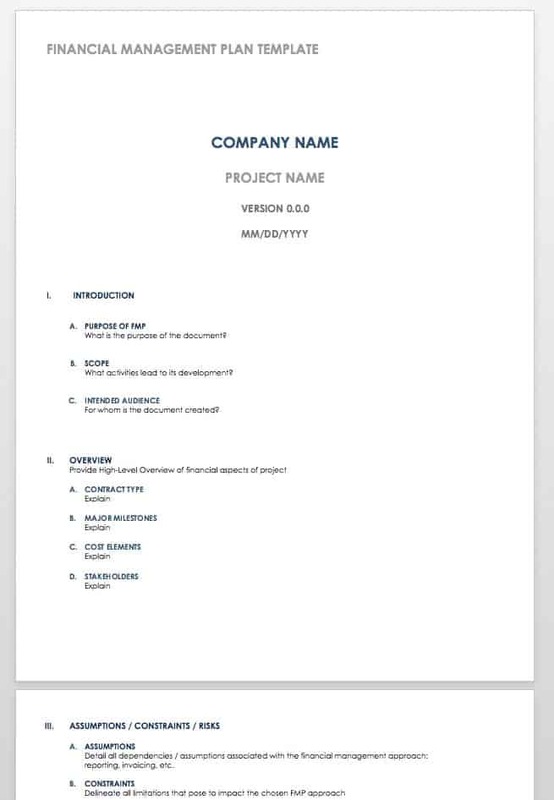 You can easily print and share this Excel template as a PDF document. Create a comprehensive marketing budget plan with monthly, quarterly, and annual views on one template. In the first column, you’ll find a list of marketing expenses that include public relations, social media, advertising, online content, and more. There is also a section for listing specific marketing campaigns so that you can estimate and compare costs for each. Individuals can also benefit from strategic financial plans. This one-page template allows you to create a personal financial plan that is concise yet comprehensive. Determine your current financial situation, create an action plan for reaching goals, and use the plan to track implementation and progress. If needed, you can include numbers for life insurance or estate planning. 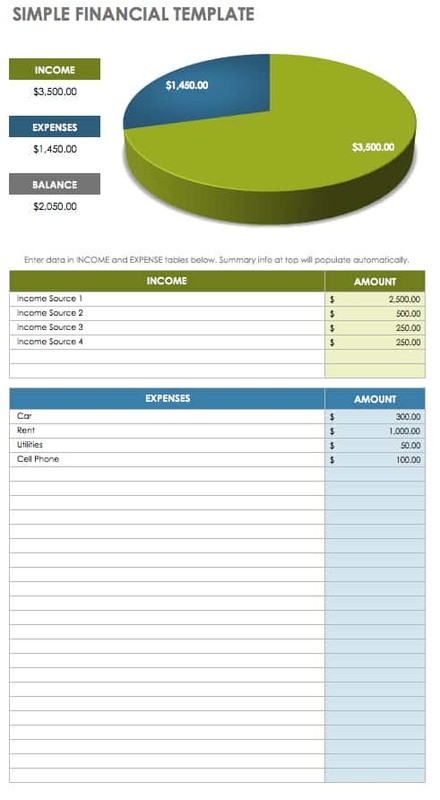 Families can use this planner to track household expenses and create a monthly balanced budget. You’ll find a list of common expenses including housing, transportation, healthcare, and entertainment, but you can also edit these categories to align with your specific monthly costs. The template also includes a section for savings to help you plan for retirement, create an emergency fund, and track investments. Goals are only dreams unless you take steps to achieve them. 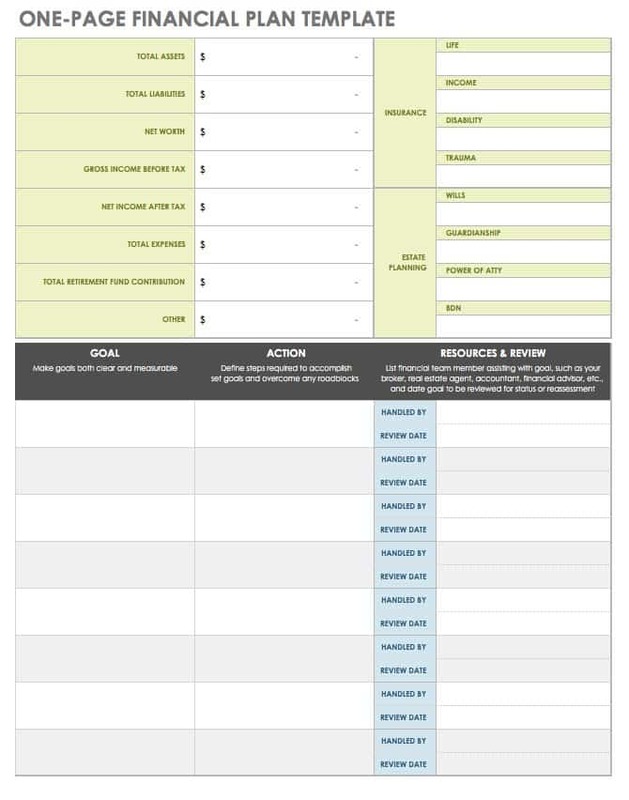 Use this worksheet to clarify your top goals, identify potential roadblocks, and list actions you can take to overcome obstacles and reach your desired outcome. 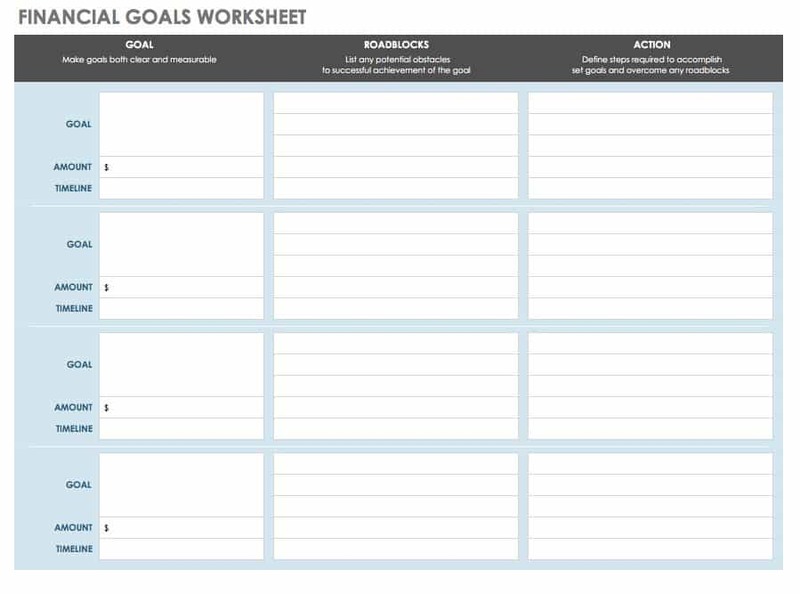 Goal planning can help prioritize objectives, create a realistic timeline, and provide accountability. 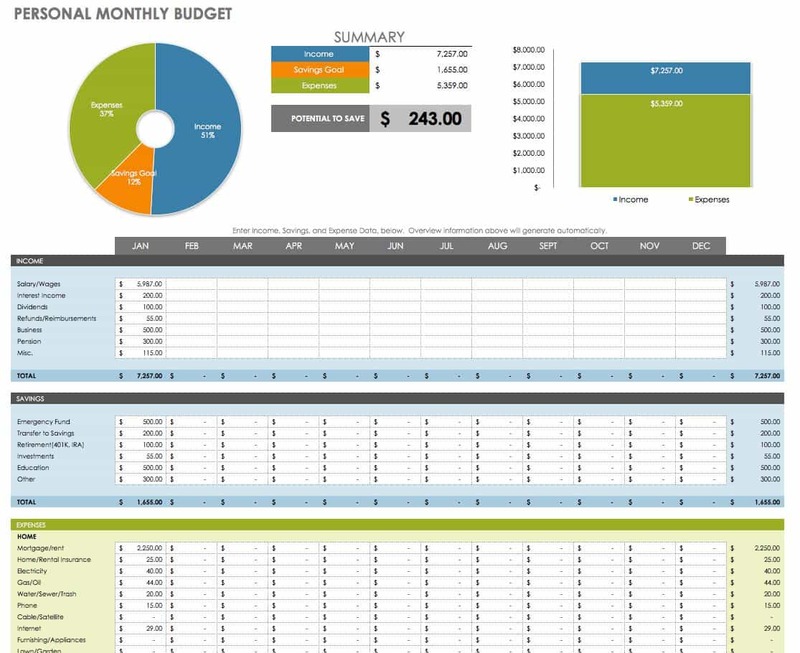 This monthly financial planner template provides a detailed budget along with a visual summary of your data. It includes sections for listing all sources of income, different savings accounts, and all of the expenses required to meet basic needs and support your lifestyle. You can use this template to plan for each month as well as to track earnings and expenditures over time. 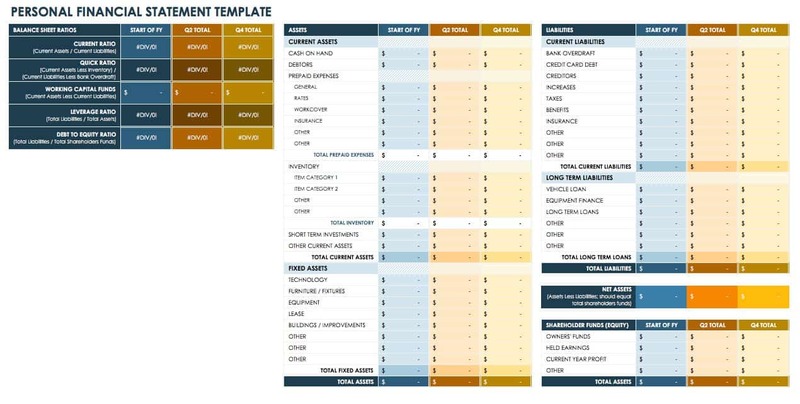 Use this template to analyze your financial situation, assess your investment strategies, and determine investment goals. This worksheet can help clarify where to make changes in your current strategies and identify your comfort level with different approaches to investing. Even if you don’t have any investments, this template can provide a starting point for thinking about and planning your goals. 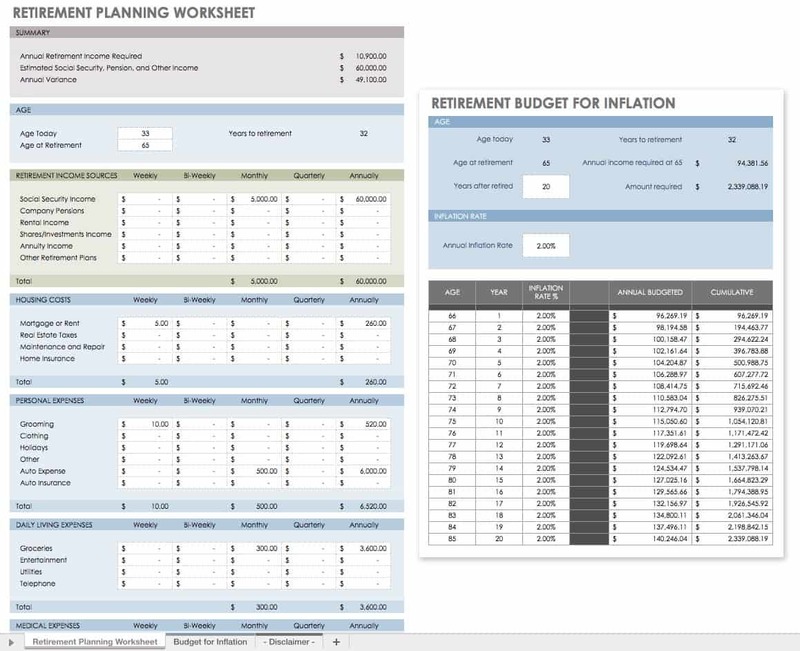 This template serves as a retirement calculator and budget worksheet that you can use to plan for retirement while accounting for inflation. If you are already retired, use the template to create a weekly, monthly, or annual budget based on your current income and expenses. You may want to consult with a financial planner to ensure that you are maximizing your income and saving sufficiently for retirement, but this template provides a basic financial planning and management tool that can help kickstart the conversation. Determine your personal net worth with this simple yet detailed template. Enter your assets and liabilities - from cash and retirement savings to credit card debt and mortgages - and the template will automatically calculate your net worth. These details provide a quick look at your current financial standing. If you’re starting a business and seeking funding from lenders or investors, you may need to provide the information you collect in this template. 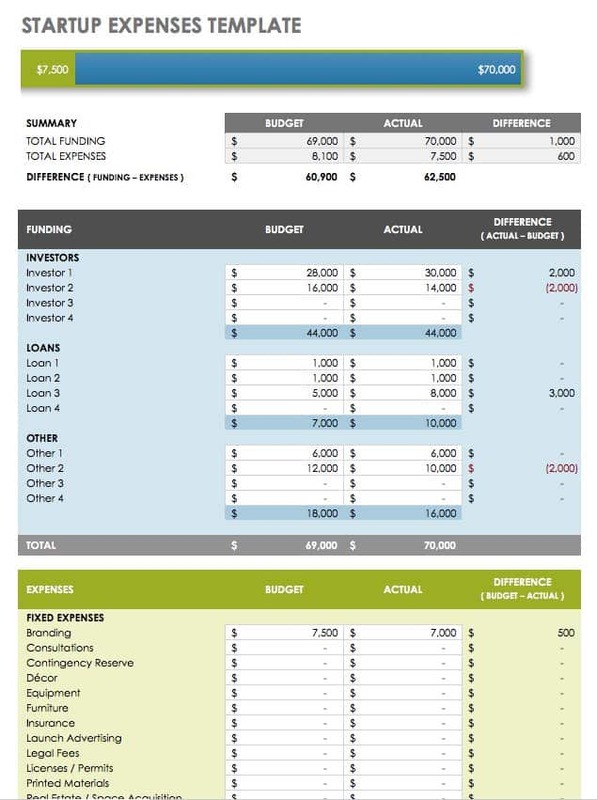 If you want to create a streamlined budget, use this simple financial template to see the difference between your income and expenses. Sections are provided for an itemized list of each, and a pie chart displays the balance between the two. This template may be helpful for individuals who are building a budget for the first time, or for those without complicated finances who just want to see how much they spend each month. 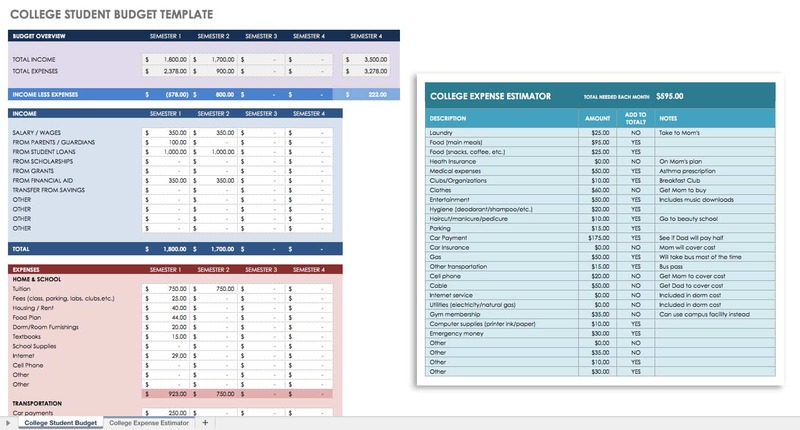 This template includes a list of potential expenses for college students. Use the details it reveals to determine how to pay for each item or where to cut costs. It also allows you to create a budget for each semester, weighing income against expenses to ensure that you have adequate funds. By creating a balanced budget, college students can focus on school responsibilities rather than worrying about finances, and also ensure that spending money is available for entertainment and wellness needs. Once you gain an understanding of your business finances, you may be looking for a way to keep budgets on track and accountable. Consider creating a system that provides visibility, access to stakeholders and accounting departments, and notifications that alert you when your budget is in jeopardy. Smartsheet is a work management and automation platform that enables enterprises and teams to work better. Over 70,000 brands and millions of information workers trust Smartsheet to help them align the right people, resources, and processes to get work done. With its familiar interfaces, Smartsheet is designed for how people actually work, leading to rapid and broad adoption across your organization. Use self-service reports and dashboards in Smartsheet to provide real-time visibility into resources, status, and performance so you can rapidly align operations to strategy. Discover why millions of professionals around the world use Smartsheet to get from idea to impact, fast.